“We’re like a family!” <- Really? Let me start by saying that a church should be like a family. It should be a place where we genuinely rejoice with those who rejoice and weep with those who weep, where we bear each other’s burdens, where we take care of each other, where the needs and longings of others are a concern to us, a place where when we gather there is warmth and palatable love and commitment. To this every church should aspire. The problem, I think, is that often when we say that a church is like a family or that it should be like a family, what we really have in mind is an idealized, Hallmark-channel, Ward-and-June-Clever-esque family. We want our church to be like a family without the messiness and tough-love of a real family. A church member may believe that their church is like a family until real discipleship begins to happen. It feels like a family until individual sin is confronted. It feels like a family until someone speaks difficult truth into your life – telling you something you don’t really want to hear. Then it is no longer a family in the idealized sense. It is divided. It is uncomfortable. People avoid each other. The “dinner table” is tense. The problem is that what was just described is real family life. In a real family there is warmth and love, but there is also messiness, there is confrontation. In a real family you find the people that love you enough to risk relationship for your greater good. In family is found the few people on earth who can speak hard truth to you, because they love you, because they care more about your long-term security and joy than momentary ease – yours or theirs. Family life is wonderful, but it is also very hard, because we aren’t perfect. The same translates to the church. It is a wonderful thing to be a part of a church, but it’s hard, because we are sinners and the Word we speak to each other confronts that reality with imposing light. Imagine a family where everyone is allowed to do their own thing. Destructive behaviors are never challenged, the father passively sits in the arm chair with beer in hand as chaos unfolds, mother is careful not to say anything to her rebellious daughter lest she upset the balance, the son is making some poor decisions, but challenging him would just upset the peace of the moment. The family is gathered, everyone is smiling, there is a kind of peace and togetherness, but it is actually kind of creepy. Because no one is being real. There is a terrible selfishness at work as the members of this family care more about the comfort of the moment than they do the good of one another. Now imagine a family where one sister sees that her sibling is becoming more and more distant, getting into relationships that could be harmful. She so badly just wants to let it go, to let there be a kind of “peace”, but she loves her sibling too much for that. She loves her sibling enough to sacrifice momentary comfort for lasting good. A father sees his son showing signs of destructive behavior, he gets along well with him and he doesn’t want to mess that up, but his love for his son motivates him to speak to him. The son’s initial reaction is to run out of the house and slam the door, but perhaps over time he begins to see that his father was right. The point being, a real family is a place where the individuals love each other so much that they are willing to risk comfort and approval for the sake of each other’s good. In Ephesians chapter 4, we are told that we grow up in Christ and are protected from harm as we speak the truth in love to each other. Sometimes when looking at that verse people take “love” to be the manner in which we speak, when I think it is more about the motivation. In his writings, Paul had some very harsh and difficult things to churches and individuals, but he was speaking the truth motivated by love. Sometimes in the church when uncomfortable truth is spoken people call it out as unloving not because it is unloving, but because it doesn’t fit into our idealized view of love – because what is being said challenges our self-love. So before you boast that your church is like a family, consider whether or not it is actually a community of loving accountability under the authority of Christ and directed by his Word. Will your “family” atmosphere hold up to the rigors of discipleship? If it will, then you are blessed and you have a true family dynamic, but if not, then your idea of family is likely idealized and skin deep. In the church we are supposed to be like a family, because that is precisely what we are in Christ! But during this age in redemptive history the reality of sin means that we can only truly be described as being like a family if our loving dynamic includes both tender love and tough love. So strive by God’s grace, anchored in his love displayed in the Gospel, to give love and receive love in both forms. By doing this we will be able to move from cheesy clichés about what it means to be a family and onward to an authenticity that leads us to lose sleep, risk relationships, weep, pray, plead, and rejoice until the whole family is together with Christ their head – safe and sound. There are few famous painting more disturbing than The Scream. It is a frightening piece of art, that leaves you wondering what was going through the painter’s mind or what is so distressing to the ghoulish, distorted figure on the canvas, hands grasping the cheeks, mouth gaping wide, looking as if they are literally melting in terror. Almost like it was yesterday I can remember seeing that painting and thinking, “I know the feeling that painting conveys.” It left me sick, scared, wanting to look away, and yet, I felt like it was a painting of my soul. One day, as a young teen, something began to stir in my heart. A dread. I suddenly had a sense of the goodness of God, my failure to honor him, and the judgment I deserved because of that. Reminders of sins committed haunted my young mind, tears began to flow when no one was around. And then, one day early in that crisis, I saw that terrible painting while flipping through a World Book encyclopedia. Agony washed over me. I stared, riveted at the twisted, tormented creature on the page – it was me. I knew what the subject of the painting was feeling. I was dirty, I was twisted, I had a offended a good God, I deserved hell. There was no self-justification, no seeking escape from reality. I was doomed and I deserved it. I felt that painting. Only the screams were bottled up inside of me. I remember crying alone, out on the farm, that painting in my mind, murmuring audibly, “I’m lost. I’m lost. Forever lost.” I wanted to claw at my heart, I would lay in bed and grind my teeth, certain my state was beyond saving. How could someone like me, who grew up with the privilege of knowing the truth, having sinned so egregiously, have any hope? I had a longing to depart and be with Jesus. I prayed and prayed for him to come so I could be with him. I was changed. As the years went by, my love would cool at times, I would fail often, my faith would weaken, but when I remember that day I felt that painting and I remember the sweet relief of the Gospel, the fire is kindled anew. I praise God for that day I felt that terrible painting. I praise God for feeling about my sin the way I did, because I believe with all of my heart it was right. Indeed, I am certain my grief did not reach the point it should have – I was spared the depths of despair that one ought to feel when their depravity is compared to the all-surpassing perfection of God. It is my hope that we would all have that moment where we have a real sense of our wretchedness, for it is then that the glory of Christ overwhelms, and we are changed. That painting is terrible, but I thank God for graciously letting me feel it. I know that I fail and my love grows cold when I lose sight of what I was and now am in Christ. My love grows cold when the news that Jesus was my wrath-bearing sacrifice ceases to be to me the good news that it is. My experience is not an authority, the word of God alone is that. But as I look at the word, what it tells us about God, ourselves, sin, and salvation, I am burdened that the church is apathetic and unholy because it is full of people who cannot identify with that painting because they have not seen themselves in the light of what God has revealed. They don’t know what it is like to stand in the light with all your filth, to sense the weight of impending, much-deserved, divine judgment, and to be appalled, lost, undone, broken. The painting I felt is only a fraction of the despair that Christ bore for me when he cried, “My God, my God, why have you forsaken me?” And the joy that followed the knowledge of mercy is but a speck of the joy that will wash over when I see my Savior in his glory and know from what wretchedness I came to what a state I have been lifted by grace. Backstrom, a new crime drama from FOX, follows a cynical, disgusting, somewhat comical, and brilliant detective in the city of Portland bearing the name of the show. My wife and I watched the pilot, one, because we enjoy crime shows and two, because the role of Backstrom is played by Rainn Wilson, better known as “Dwight” from The Office. I don’t normally search for things that are very deep in a show like this, but a couple of quotes from Backstrom stood out to me as important from a Christian, Gospel-centered worldview. Clearly these quotes are significant to the character development of Backstrom and are meant to give the viewer an insight into his mind. There is one quote in particular that drew my attention. But before I get to it, I will give a little background…. Such a line is meant to show just how deep his cynicism and negativity run, with hints of emotional baggage from his childhood. I am no prophet but I estimate that this is meant to be the beginning of his character trajectory. The writers will pull him over time out of his negative estimation of mankind to the point where he will have to admit that there is good in some, if not in everyone. Again, that is my guess, and considering how cliché network television tends to be, I would stake money on it. Was Jesus a cynic like Backstrom? The answer is no. Jesus is a realist. Jesus knows what is. Furthermore, while Jesus saw “the everyone in everyone” and Backstrom saw “the everyone in everyone”, the trajectory of that truth is very different in the case of Jesus’ story. 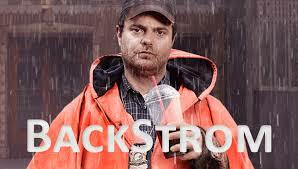 Backstrom is being shown by his words to be an extreme cynic. This provides the foundation for his character to develop, growing in confidence in his fellow man, seeing that there are exceptions to his rule. But Jesus came precisely because of “the everyone in everyone”. This truth is foundational to the trajectory of Jesus’ story, but that story moves in a completely different direction than Backstrom’s. Jesus story, the Gospel, has a trajectory marked by grace and redemption so that “the everyone in everyone” will not remain what it is. Jesus came because of “the everyone in everyone” so that every one of his people could have in them that which is uniquely good, namely the unique goodness of Jesus himself. He did not come to draw out the good in mankind, but to give of his goodness so that “the everyone in everyone” would not have the last word. Jesus is not a cynic. He is a realist. And the reality is that there is an “everyone in everyone” and it is called sin. But Jesus came and as a man was the exception to the norm, he died for those under that norm, and then he rose victorious over it. And by this he set the trajectory for the day when that reality would be no more. “I was meant to do this”. This reveals something interesting to me about people. That is that most people at the end of the day do not have any problem with an impersonal, sovereign force. Fate, if you will. People talk about existing for a purpose when their worldview would affirm that they really have no purpose. They deny the existence of God or at least they deny the idea of a God who is sovereign and “works all things according to the counsel of his will” (Eph. 1:11). Yet, when they reach their goals they are eager to attribute their success to some deterministic “meaning” for their life. Despite this almost innate openness to the idea of fate, even many so-called Christians reject and are downright offended by a God who determines their destiny. But if not God then what? A materialistic universe has no plan to execute. So tell me, if you were meant to do something, then who meant it? If you believe there is a God who has “a plan for your life”, then how will he bring it about? Who formed you with your skills and talents? What this shows us is that when people speak of how unthinkable the idea is that God is sovereign over everything, their problem isn’t with determinism, but with the person behind it. People have no problem with the idea of something setting the course of their lives. People make determinism out to be the big issue, but it isn’t the big issue. They aren’t troubled with the logic of how free choice interacts with “destiny” when they step on the stage or when their fate hands them their dreams. The problem they have is not an impersonal, determining force – but a personal one. A being that chooses their destiny for them – and not always the destiny they want. The problem people have with a divine sovereign is because “Although they knew God, they did not honor him as God or give thanks to him, but they became futile in their thinking, and their foolish hearts were darkened.” (Romans 1:21 ESV) People embrace the idea of fate, but put God as the power behind the fate and they deny it. This is because in our sin we do not “honor him as God”, instead we bring him down to our level. And who wants an equal determining their destiny? A friend can’t even tell me what to do! There is a selfishness behind this that is clear. For when people’s dreams come true they say “I was meant to do this” or “I feel this is why I am on earth.” But when our dreams crash and burn we turn to the God we ignore and ask “why?” or we simply say “This isn’t how life was supposed to go.” So in our sin and self-idolatry what we want is an impersonal force choosing a brilliant destiny for us where we are successful and happy – where we are a god. We want a universe that serves us as god, rather than seeing ourselves as part of a universe that was made to serve God. Christians do this as well. I meet so many Christians who despise “Calvinism” and by that they mean the idea of total sovereignty, yet when facing the unknown they take comfort that God “has a plan” for them. But when things go bad they don’t respond with “The Lord gives and the Lord takes away” instead they either ask, “God, why would you let this happen?” or if they are more spiritual, yet want to retain their best-buddy view of God they say, “The devil did this”. A charge sometimes brought against the total sovereignty of God by Christians is that this belief leads to passiveness in our Christian lives. In response to that charge it should be noted that even those that deny God and are pursuing their “destiny” actually use their belief in an impersonal, sovereign force as an impetus to pursue their dreams. They pursue their dream because they believe it is their destiny to reach their goal. Likewise, as a Christian my destiny is to be conformed into the image of Christ, that is the goal. The knowledge of that, if I have a new heart, should be a sufficient impetus to pursue what I was “meant to do”. To labor to the end that I would reach my destiny! If that logic works with wanna’be pop-stars, why not with us as well who have the promises of God to boot? I know this is a very scattered post, so let me condense my point. People don’t have a problem with sovereignty, they have a problem with a sovereign God. Why? Because if they want a God at all, they want one whose plans to coincide with theirs. Today our rejection of God’s sovereignty is a manifestation of our rebellion, as it was for Adam and Eve in the garden when they despised the idea of a God who would choose their destiny for them. It is my desire that many would come to see the folly of their logic, that I would see my own, and that we would honor God as the sovereign God that he is and embrace the destiny he has chosen as good and right, even if understanding it is beyond us.